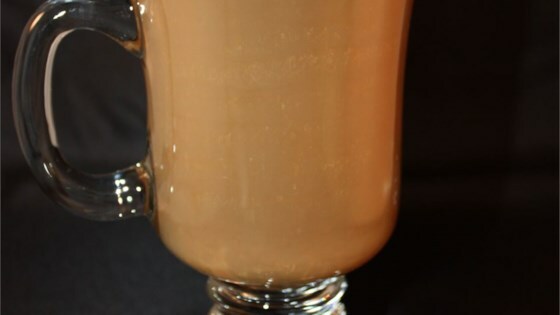 "Fresh hot coffee gets a little added pep with the addition of Irish whiskey and Irish cream." In a coffee mug, combine Irish cream and Irish whiskey. Fill mug with coffee. Top with a dab of whipped cream and a dash of nutmeg. I served this with my traditional irish desserts. I also used Kahlua instead of the Irish cream and it was a big hit. Perfect for a chilly night! Enjoyed by all, especially the grandparents! This is such a perfect winter after-dinner drink. It works well in hot chocolate, too. For some reason I am having a hard time typing . . . just kidding! These are great! This drink was way too strong. My mom and husband thought the same thing. Next time I will try leaving out the whiskey and just adding Irish cream, which still has alcohol. Oh man!!! These could quite possible be my new favotire coffee drink. I LOVE them!